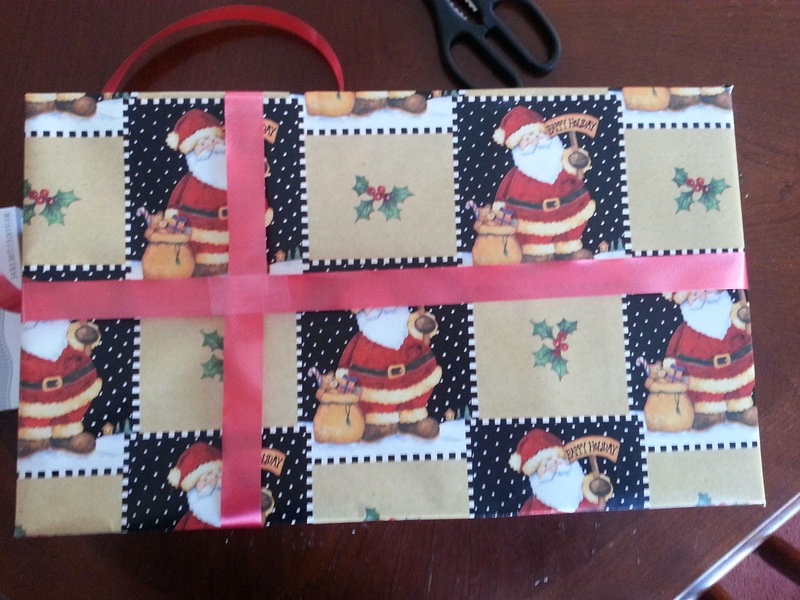 I jokingly refer to myself as a professional gift wrapper. I used to work in a jewelry and gift store that was known for their free gift wrapping. Not only was it free, but it was beautiful. We put a lot of effort into making sure that every package looked just the way we wanted it to. Customers would oooh and aaah over the gifts and ask if we had to take a class to learn to gift wrap that way. And I LOVED it!! 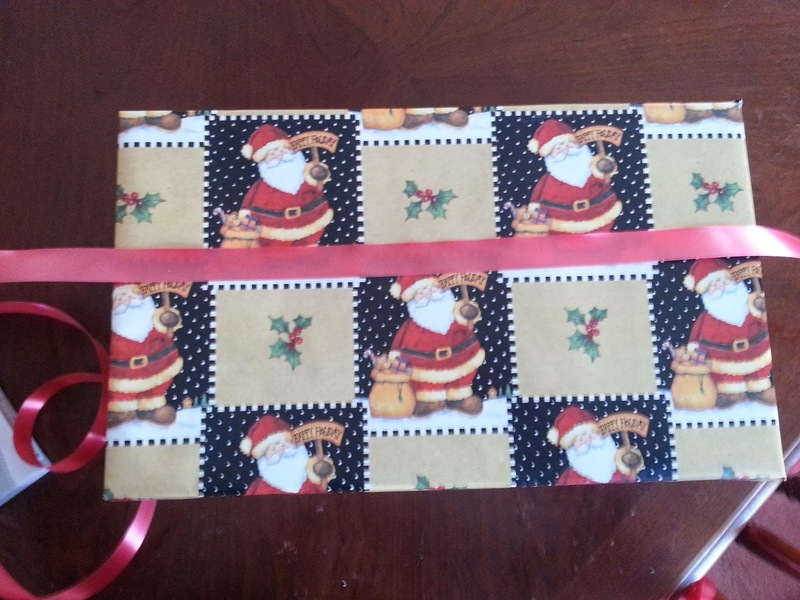 I absolutely LOVE wrapping gifts! 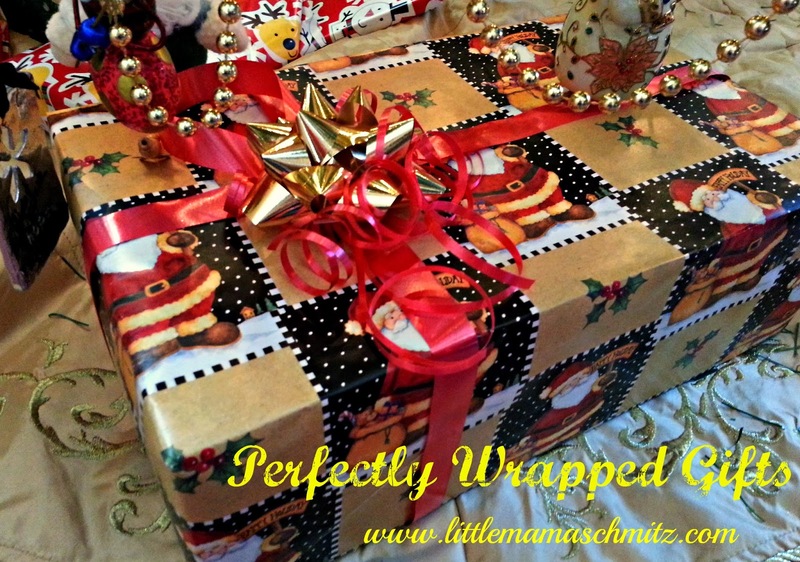 I have wrapped everything from small to large gifts; squares, cylinders, you name it; flat envelopes containing gift certificates to giant wall clocks! Here is my method, along with photos, to help you! Notice how when I fold up the paper on the end, it goes just past the "half way point" of the box. 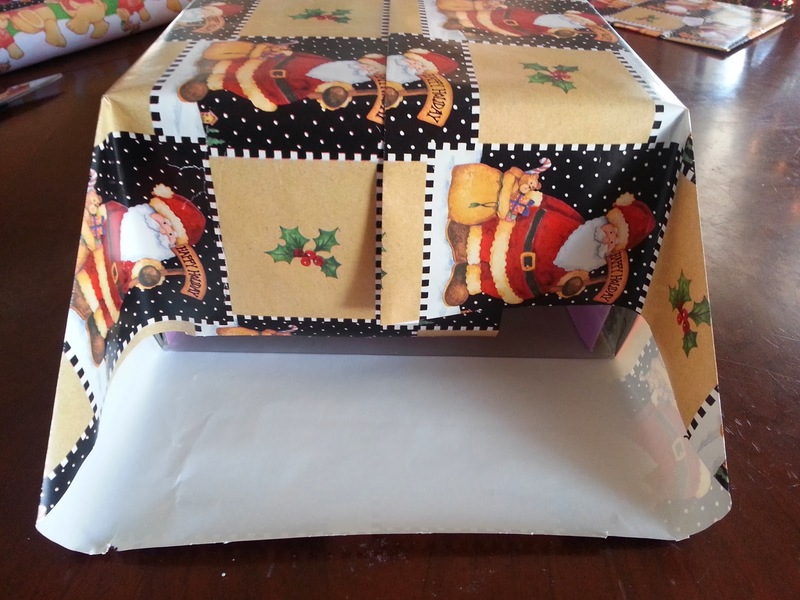 This will ensure that the ends will fold nicely with out holes or loads of excess paper. Now that you have the appropriate size paper, lets begin. This package will take 3 pieces of tape the wrap. 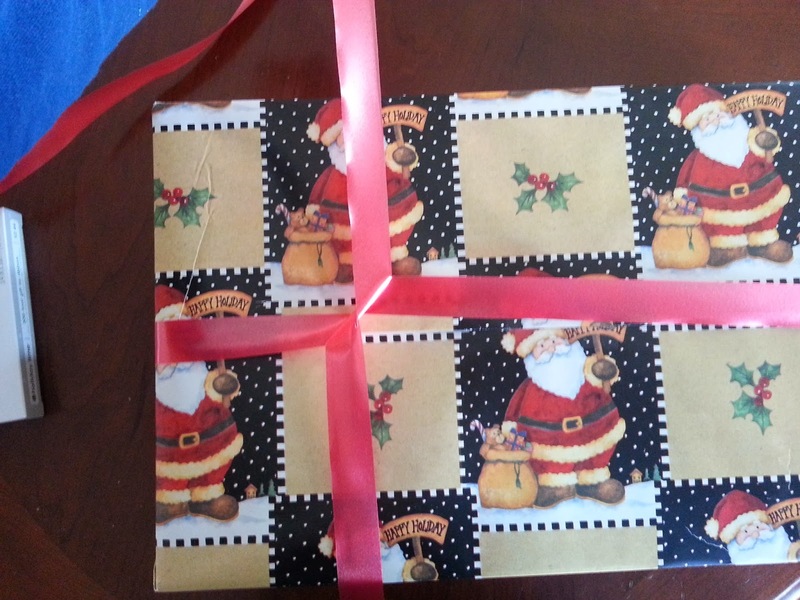 The only time I use more than 3 pieces of tape is if it is an odd shaped or very large gift. Begin by wrapping your paper around the package. I begin by wrapping it around the shortest distance. 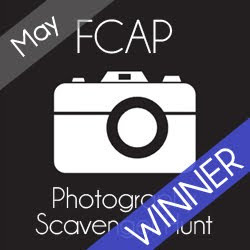 Not sure if that wording makes sense or not, but you can see in the photo that I wrapped it around the short way. Next, when I get to the overlap, I fold over the edge that is going to be on the outside. 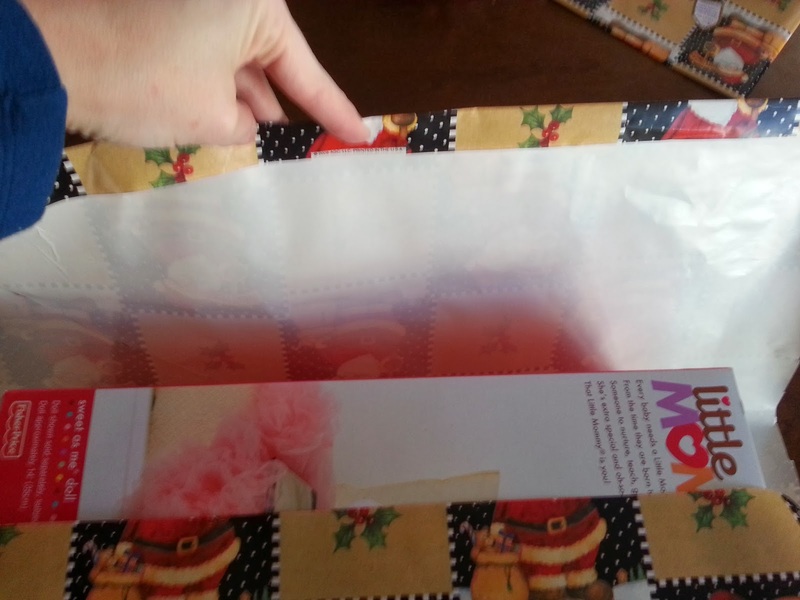 This helps re-enforce the edge so that it doesn't tear as easily while I'm wrapping, transporting etc. 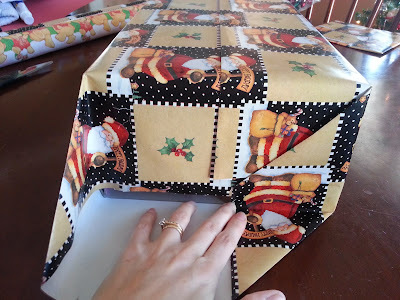 Another key step to having a beautiful gift is pulling the paper tight! DO NOT tape the paper to the package! Hold it in place with one hand while you pull the other side tightly into place. Then tape it down. Pulling the paper tight is very important. Loose paper makes an ugly package. Now we move on to the ends. 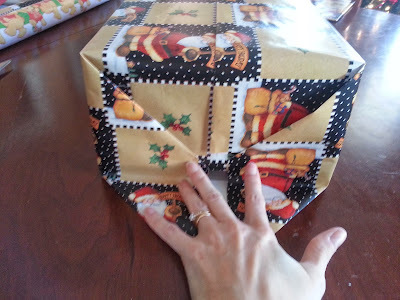 Start by folding in the side that has the seam. Smooth it out, pull tight and then crease it. 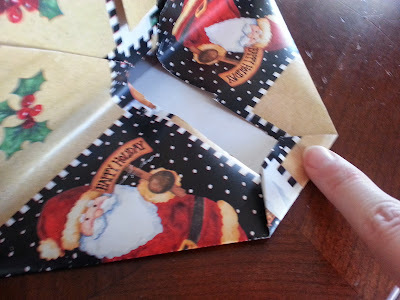 While you hold the top part tightly in place, fold one side in. Next, fold the other side in. 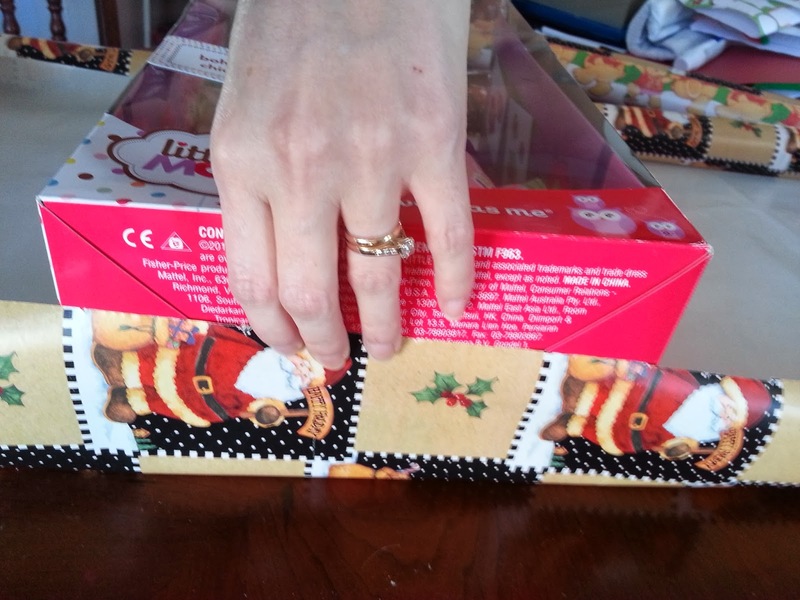 Make sure that you are holding the first sides in place and pulling everything as tightly around the package as you can. Now, fold over the edge and pull the bottom into place. If you have everything nice and tight, you will need only one piece of tape on the last flap to hold it all in place. Repeat on the other end. 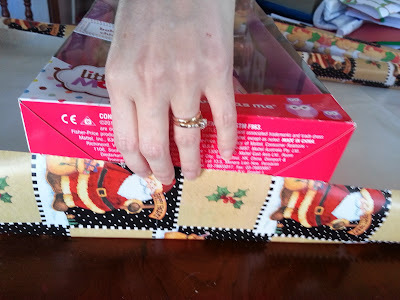 Next, take your fingers and run them along all of the edges, sort of creasing the paper around the box. It will make the edges clean and crisp looking, and if your paper is a little loose it will help hide that. Done! 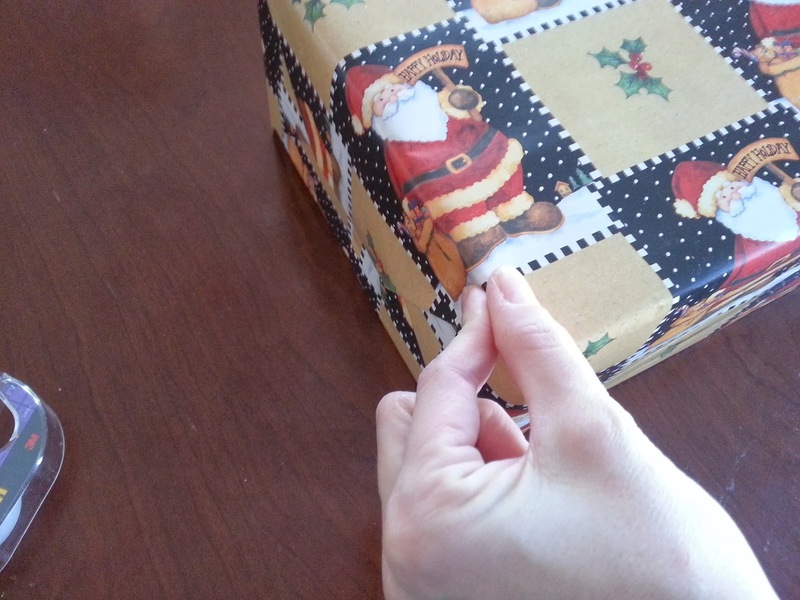 Your gift is wrapped, and you only used three pieces of tape! 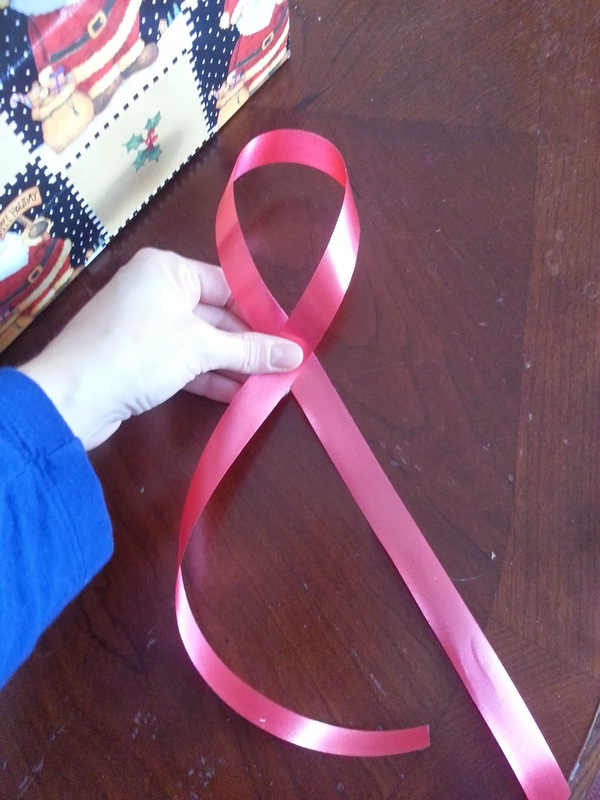 Read on for instructions for adding ribbon! I love finishing gifts with ribbon and bows. 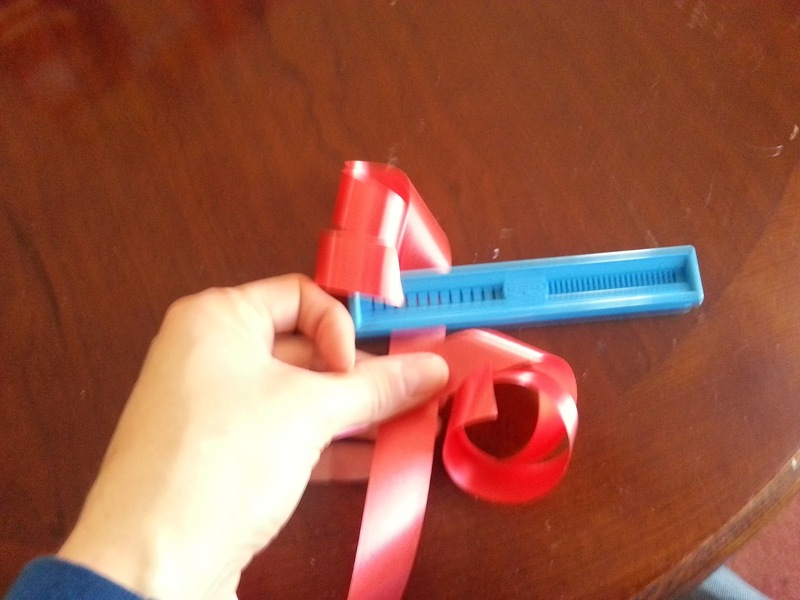 Cut a section of ribbon that is big enough to go around your package both directions. 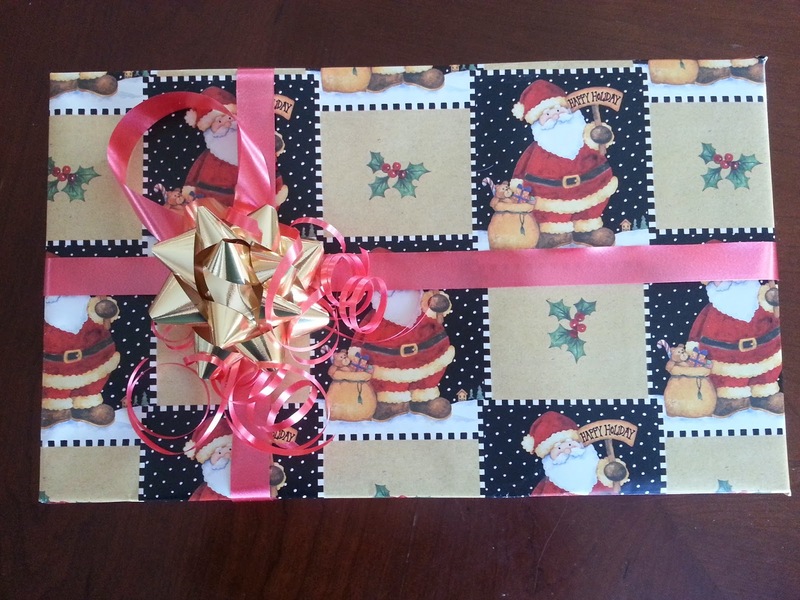 Place the approximate center of the ribbon across the top of the gift. Wrap is around the edge and then flip the gift over. Line the ribbon up with the paper seam so that it will cover the seam. 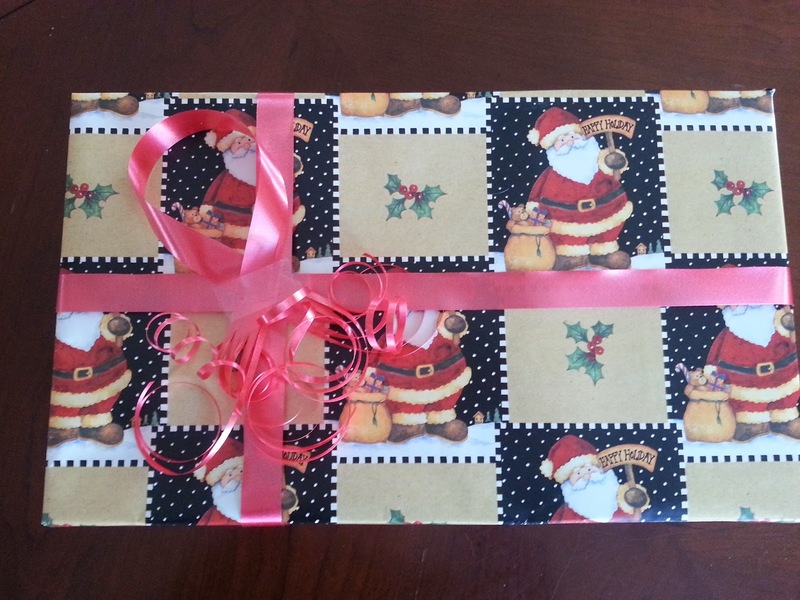 Decide if you want your ribbon to wrap around the center or to one side. I like doing mine to one side. This is a little difficult to explain, pull the ribbon tight and twist the ends around each other as shown above. 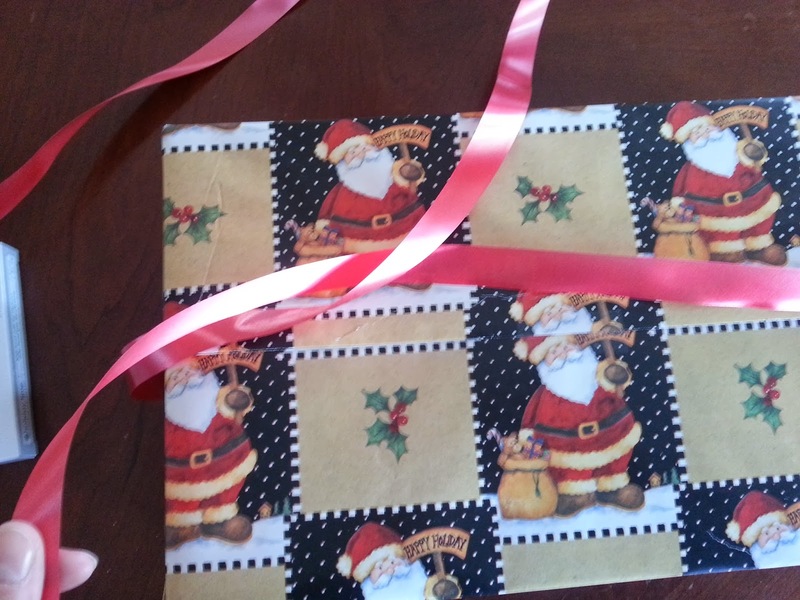 Pull the ribbon tight and wrap it around the edges. Flip the gift back over so that it is top-side up. Trim excess ribbon and tape into place. Now you can get a little fancy of you want. 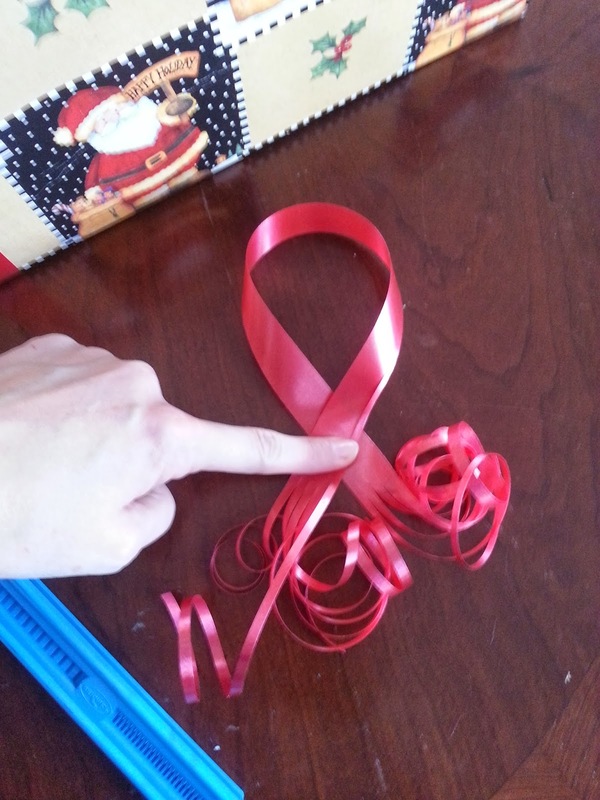 Cut a section of ribbon and form a shape like shown above. 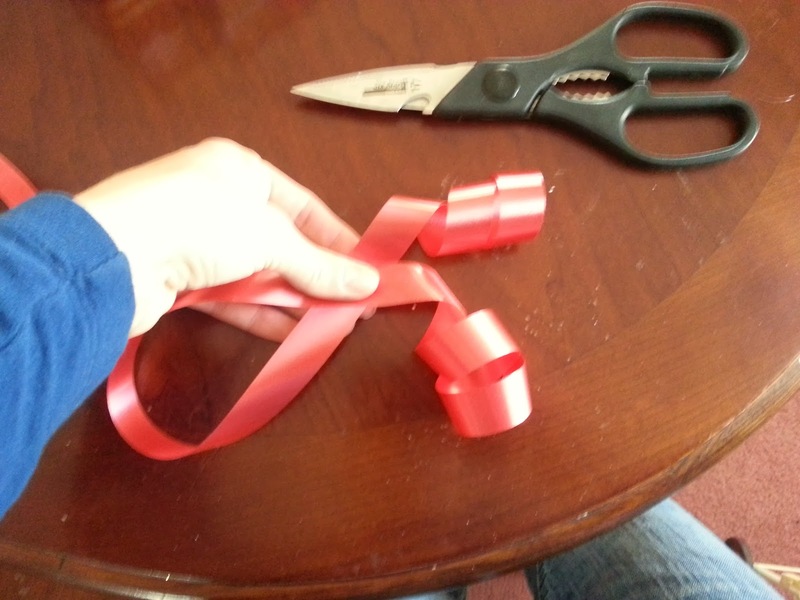 Run the edge of your scissors along the ribbon "tails" to curl it. Then, if you get one of these fancy do-dads, you can shred the curls. Then it looks like this. So pretty! Tape your curls over the spot where the ribbon met up on the package. Add a bow and arrange the ribbon curls around it. Voila! You are finished! I buy the purple Scotch tape that is a satin finish, gift wrap tape. It looks nicer because you really can't see the tape. 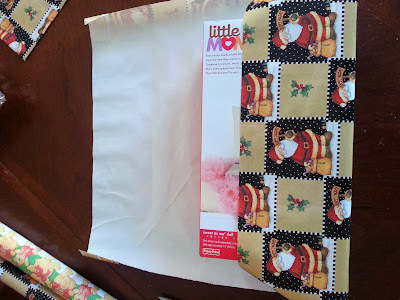 Use large prints on large packages and small prints on small packages. Never the other way around if possible.